I recently discovered the Roadside America website/app (for iPhones) and it’s quickly become one of my absolute favorite references for finding weird/cool things/places to see/visit. While in South Dakota I took full advantage of my brother’s iPhone and we happened upon the Mammoth Site of Hot Springs, South Dakota. The Mammoth Site is both a museum and an active paleontological site. More than 26,000 years ago, large Columbian and Woolly mammoths were trapped and died in a spring-fed pond. For centuries the bones lay buried, until discovered by chance in 1974 during excavation for a housing development when earth moving equipment exposed a fossil. Luckily, the Mammoth Site was preserved and today it is the world’s largest Columbian mammoth exhibit and a world-renowned research center for Pliestocene studies. To date, 61 mammoths have been identified, along with the remains of a giant short-faced bear, camel, llama, prairie dog, wolf, fish, and numerous other plant and invertebrate fossils. I thought the coolest part of this site was the fact that it is both a museum and working dig site. There are programs each summer when volunteers come to the site to work – all under the curious gaze of the visiting public. It made for a rare opportunity to see work in progress and to gain a better understanding of exactly how such site are run. And, honestly, I found it way more interesting to see the bones in situ vs in a more clinical museum setting. One of the most amusing facts of the whole tour (for me anyway) was that so far, all of the mammoths found have been male. Apparently they just happened upon this nice little water hole, thought to go for a swim, then couldn’t climb back up the slippery sides. Kind of a sad story, but for some reason it just seems like a very male scenario (sorry guys). Overall, I definitely found this place to be worth the price of admission and a few hours of your time. If you have kids, even better! P.S. I apologize for photo quality – the lighting here was all over the place and I only had my cell phone (rookie mistake not bringing an extra battery for the SLR – oops!). This model was totally surreal – those bones are just SO big! Devils Tower is a butte in the Bear Lodge Mountains (which are a part of the Black Hills) in northeastern Wyoming. It rises quite suddenly almost 1,300 feet above the Belle Fourche River, standing 867 feet from base to summit. The area was designated as a monument by President Theodore Roosevelt (beginning to see why he made the mountainside at Mount Rushmore) in 1906. 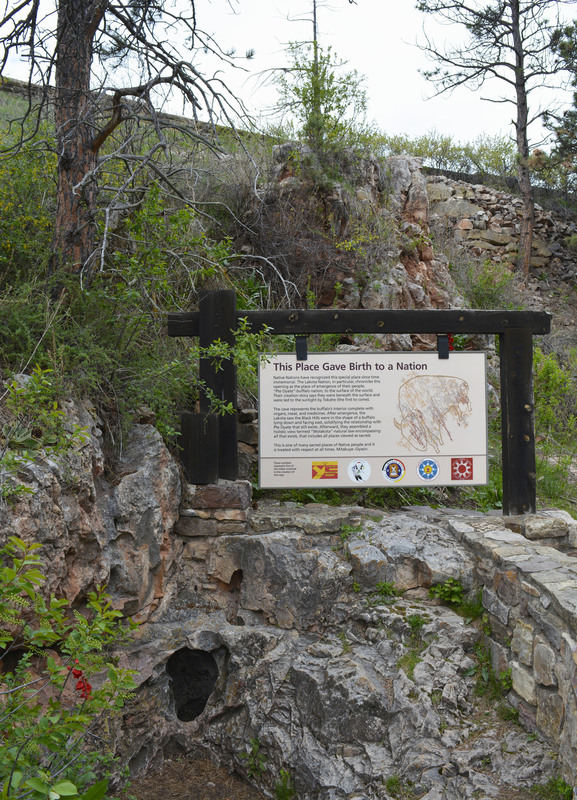 This site is considered sacred to the Lakota and many other tribes that have a connection to the area. Local tribal names for the butte include Aloft on a Rock (Kiowa), Bear’s House (Cheyenne, Crow), Bear’s Lair (Cheyenne, Crow), Daxpitcheeaasáao, “Home of bears” (Crow), Bear’s Lodge (Cheyenne, Lakota), Bear’s Lodge Butte (Lakota), Bear’s Tipi (Arapaho, Cheyenne), Tree Rock (Kiowa), and Grizzly Bear Lodge (Lakota). The name Devil’s Tower originated in 1875 during an expedition led by Col. Richard Irving Dodge when his interpreter misinterpreted the name to mean Bad God’s Tower, which then became Devil’s Tower. All information signs in that area use the name “Devils Tower”, following a geographic naming standard whereby the apostrophe is eliminated. According to the Kiowa legend, before the Kiowa came south they were camped on a stream in the far north where there were a great many bears, many of them. One day, seven little girls were playing at a distance from the village and were chased by some bears. The girls ran toward the village and the bears were just about to catch them when the girls jumped on a low rock, about three feet high. One of the girls prayed to the rock, “Rock take pity on us, rock save us!” The rock heard them and began to grow upwards, pushing the girls higher and higher. When the bears jumped to reach the girls, they scratched the rock, broke their claws, and fell on the ground. I didn’t look at any photos prior to our journey to Devils Tower, so I had no idea what to expect. Seeing this massive butte rise out of the gently rolling hills of northeastern Wyoming was…magical. Seeing it grow as we came closer, I was struck by how odd and out of place this bit of rock was – and I can totally understand why it’s considered a sacred area. We enjoyed beautiful sunshine during our hike around the butte. We spent some time watching the intrepid climbers and taking a hundred photos of the rock, trying to capture the mystical feel of the place. I don’t know if I succeeded in that personally, but it’s certainly a location I’ll never forget! I must admit, when I originally planned this little road trip through western South Dakota, I had no idea just how much there was to see and do. In addition to Mount Rushmore and Badlands National Park, there’s also nearby Wind Cave National Park. Wind Cave National Park is located in southwestern South Dakota near Black Hills National Forest and Custer State Park. Established in 1903 by President Theodore Roosevelt, it was the 8th National Park in the U.S. and first cave to be designated as a national park anywhere in the world! In 1881 Jesse and Tom Bingham were also attracted to the cave by the whistling noise of the air coming out of the cave. As the story goes, wind was blowing out of the cave entrance with such force that it blew off Tom’s hat. A few days later when Jesse returned to show this phenomenon to some friends, he was surprised to find the wind had switched directions and his hat was sucked into the cave. This change in movement of the wind is related to the difference in atmospheric pressure between the cave and the surface. The cave is considered a three-dimensional maze cave, recognized as the densest (most passage volume per cubic mile) cave system in the world. It is currently the 6th longest cave system in the world with over 140 miles of explored cave passageways. An average of 4 new miles of cave are discovered each year (and if you find a new chamber, you get to name it!). This maze of passages is home to boxwork, a unique formation rarely found elsewhere. Approximately 95 percent of the world’s discovered boxwork formations are found in Wind Cave. Above ground, the park includes the largest remaining natural mixed-grass prairie in the U.S. Bison, elk, pronghorn, and prairie dogs abound, so drive carefully and enjoy the view from a safe distance! This was another park I was totally unaware of until we happened to see it on the map. Being a huge fan of caves, I made sure we saw this one! The tours are guided and the guides are very knowledgeable. It is a wet cave and there are a lot of stairs, so be aware of that before you sign up. Entrance to the park is free but the tours are available for a small fee. The boxwork is pretty phenomenal and make it well worth a visit – especially if you enjoy caves! While we were in the area visiting Mount Rushmore (my bucketlist item), my dad wanted to check off one of his own must see places – Badlands National Park. Badlands National Park is located in southwestern South Dakota. It comprises approximately 244,000 acres (379 sq miles) of sharply eroded buttes, pinnacles, and spires blended with the largest undisturbed mixed grass prairie in the U.S. The area was established as a National Monument in 1939 and designated as a National Park in 1978. Driving through the park you can spot bison, bighorn sheep, prairie dogs (who provide endless entertainment), and any number of birds. The park is also home to the black-footed ferret, once of the most endangered mammals in the U.S. In addition to these modern day animals, the park’s geologic deposits contain one of the world’s richest fossil beds. Ancient mammals such as the rhino, horse, and saber-toothed cat once roamed this area. Can you see the buffalo?? How many tusks can you spot? ?